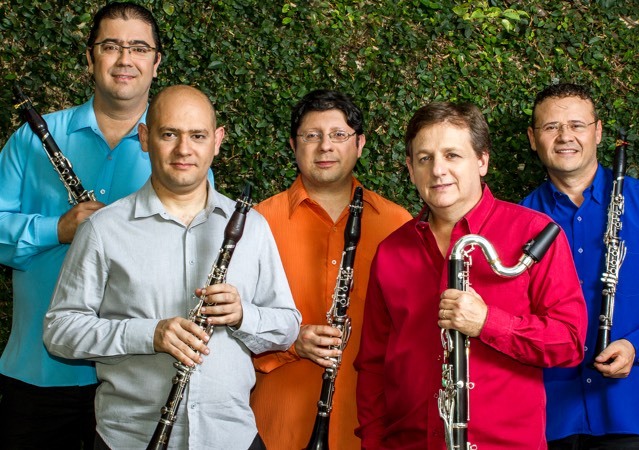 Madeira de Vento is a Brazilian clarinet quintet that has been acting in the Brazilian music scene since 1998. Since then it has developed intensive research on the formation of a repertoire with emphasis on Brazilian music. It also encourages the production of new arrangements and stimulates the creation of new compositions for clarinet ensemble. The quintet mixes elements of classical music and popular Brazilian music. The result of these works are presented on the albums: “CHOVENDO CANIVETES” (2003) and “ASSANHADO” (2009). In addition, MADEIRA DE VENTO has attended ClarinetFest in Atlanta 2006, Vancouver 2007 and Assisi 2013. Also, the International Clarinet and Saxophone Festival in the Nanning City, China in 2010. MADEIRA DE VENTO presented as soloist the CONCERTINO FOR CLARINET QUINTET AND STRING ORCHESTRA with Santo André Symphonic Orchestra, Santos Symphonic Orchestra, Campinas Symphonic Orchestra and recently with University of São Paulo Symphonic Orchestra (OSUSP).